We often get questions about the 6.5 Creedmoor Cartridge — folks ask where they can find good resources for this cartridge, which is popular with Across-The-Course, High Power, and tactical shooters. We did some searching and found that the August 2011 digital edition of Shooting Sports USA has a good article for all fans of the 6.5 Creemoor. Here’s an interesting update on Hornady 6.5 Creedmoor brass and loaded ammo. In a move to improve case quality and neck uniformity, Hornady recently changed the 6.5 Creedmoor production process, eliminating the case-washing step after annealing. So now you will see annealing coloration on 6.5 Creedmoor brass, just like on Lapua brass. Dennis DeMille of Creedmoor Sports wanted to improve the consistency/uniformity of 6.5 Creedmoor case-necks. At Dennis’ suggestion, Hornady conducted tests which showed that the “standard industry practice” of washing brass could potentially alter the necks in undesirable ways. Bottom line, unwashed annealed brass was determined to have an accuracy edge over washed brass. Looking at these results, Hornady decided to forgo the post-anneal washing process. As a result, the latest 6.5 Creedmoor brass now displays the distinctive coloration left by neck/shoulder annealing. Learn something new every day, eh? 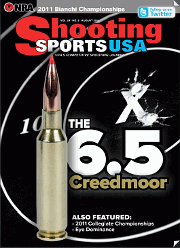 Share the post "6.5 Creedmoor Featured in Shooting Sports USA Archive"
The link takes you to the CURRENT edition of Shooting Sports USA. The August 2011 issue doesn’t even show up in the archives, and WOW is that an unfriendly and cumbersome site to navigate. What twist rate is the Creedmoor designed around?